Keylink are specialist stockists for chocolatiers and anyone else who works with chocolate. Our story began way back in the late 1960s when Fred Waldman, an Export Sales Manager for a Sheffield steel company, used to bring back fancy European chocolates from his trips abroad for his wife, Sue. The chocolates were fresh cream filled and so popular that Fred and Sue decided to set up a business importing them. The person that helped Fred and Sue to advertise locally had a father who worked for a delicatessen in Sheffield who sold into House of Fraser, and so from these humble beginnings Keylink was born and became the first company to import fresh cream Belgian chocolates by air freight to the UK (Manchester). They packaged the chocolates up and sold them as finished boxes of chocolates by mail order. The family owned business grew by supplying luxury confectionery from Europe and other chocolate related items for local chocolatiers. Then over the years, ingredients, equipment and accessories were added to Keylink’s fast developing range. Lots of people ask us where the name ‘Keylink’ came from – it was a general term as Sue and Fred were unsure at first of the direction in which they would take the business, but they knew they were the ‘key link’ between Europe and the UK for fresh cream chocolates. A demand for liqueur concentrates led to Fred securing a relationship with Emile Lefebvre who worked for Cointreau (now Rémy Cointreau Gastronomie), which eventually led to the sole distributorship for Keylink; a relationship we have held for over 30 years. When Fred and Sue decided to retire in 1991 Sanjeev Ramchandani took over the company and by 2000 the confectionery side of the business had been wound down to focus on expanding and developing further ingredients, equipment, packaging and accessories for chocolate work in the UK and Europe. 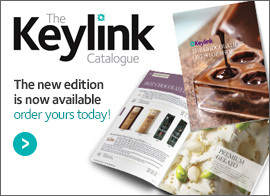 Today Keylink supplies a complete range of ingredients and décor products from some of Europe’s finest manufacturers. We are now the premier supplier of chocolate, ingredients and equipment - including the most extensive selection of confectionery packaging in the UK - to the chocolate industry. We remain as passionate as ever about supplying high quality products with a large helping of great customer service! We have long-standing partnerships with some of the leading suppliers across Europe. Regarded by many professionals in the industry as one of the best in the range, this brand is built on taste and inspiration. The Cacao Barry range of chocolate couvertures is produced in France and offers many different and amazing taste profiles, each with its own unique story. Callebaut is well known and respected in our industry for the great taste and workability of their huge range of chocolate/couverture. Delivering consistency every time, this enables your finished creations to achieve and maintain the highest of standards. Schokinag (previously DeZaan) offers high quality, competitively priced Belgian chocolate. Our range of Schokinag core grades has been a trusted favourite of many chocolatiers for over 25 years and some of our customers consider Schokinag to be a well-kept secret! Veliche Gourmet Belgian chocolate (previously DeZaan Gourmet) enjoys a strong heritage of chocolate making. This range offers different taste profiles, from powerful, well balanced dark chocolate couvertures to the finest Belgian milk chocolate couvertures and a rich, creamy white chocolate; all perfect for artisan production. Lubeca is a range of chocolate couvertures, premium marzipan, nuts and praline pastes. Their chocolates are made using specially selected cocoa varieties from Ghana, Venezuela, Trinidad, Madagascar and Peru. They are particularly known for their incredibly smooth mouthfeel and high shine, which is achieved by a lengthy conching process, ensuring a very clean and mellow taste. Lubeca is owned by the Friedrich Bluhme & Else Jebsen Foundation, a charitable organisation that donates their earnings to worthy projects in and around the city of Lübeck. CasaLuker is a range of chocolates and cocoa products made by passionate people in Colombia and its neighbouring countries. They use International Cocoa Organisation classified “Fino de Aroma”, or “Fine Flavour” Criollo and Trinitario beans to make their chocolate, an exclusive title given to only the top 7-8% of the world’s cocoa. The beans are harvested and made into chocolate in Colombia using cocoa butter from the same beans and local sugar, making all ingredients fully traceable. Since 1981, Ravifruit has established itself as one of the world’s leading suppliers of frozen and ambient fruits to professionals in the catering sector and to industry. Amongst professionals, Ravifruit is increasingly acknowledged as producing the highest quality fruit purées in the world. Exclusive to Keylink. Vilamajó’s dedication to quality ensures they only offer you the best ingredients; they carefully select fruit using only 3 types of Valencia oranges, for example, from over 50 varieties grown worldwide. Nutural World is a multi-award-winning artisan producer of high quality nut butters. Their products are produced in small batches, using traditional stone grinders. All of their products are certified vegan, Kosher and sugar-free, with no added salt, oil or artificial flavours. “The expert in caramels”, Nigay have been producing an enormous range of premium quality caramels for various applications for over 163 years. We supply Nigay caramel products for use in chocolate and gelato. A long-time supplier of couvertures and chocolate, including organic and a ‘better for diabetics’ range, and many other ingredients. Crystallised flowers and petals made by sugar-coating real flowers. A leader in the European packaging market. Suppliers of bags, Kraft wrapping papers and pre-tied bows. Suppliers of PET cartons and boxes. Keylink also work with a number of smaller packaging suppliers to bring you a great range to cover all your needs. Keylink are also proud to be the exclusive UK and Irish distributors for Rémy Cointreau Gastronomie, for their entire range of culinary alcohol concentrates including Rémy Martin Cognac Fine Champagne, Cointreau®, Passoa and Mount Gay Rum, as well as Griottines®. Chocolate at Home is a division of Keylink, producing chocolate-making kits; exciting shelf-ready products that come with a generous reseller’s discount. Our sister company, KeyChoc can help - click here to visit the KeyChoc website.